The game is cancelled due to bad weather and field condition. The new date of the game will be posted as soon as possible. The Enschede Broncos will open their season on sunday the 8th of February. 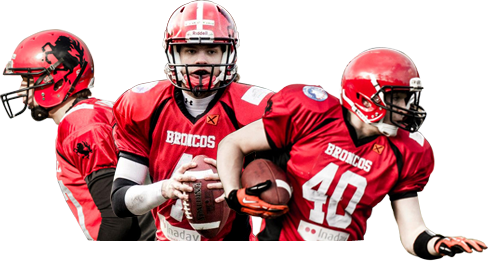 The team that will face the Broncos on the gridiron are the fiercesome Raptors from Eindhoven. The two teams have a history together, even though they haven’t met each other on the field last season. They played against one another multiple times in the last 5 years. The last time was during the semi finals of the 2013 season, in which the Broncos won. During the 2014 season, the Raptors have proven that they are a force to reckon with. Especially in the first half of the competition they showed that they are a strong and solid machine. However, the Broncos have developed as well. They have been conquering the winter, under the lead of a new headcoach and a young, smart and ambitious coaching staff. The squad from Enschede has grown in size, and recruited various local talent. Come, sunday february the 8th at 14:00, to see how this game will evolve. As usual the entrance will be free, dress in red to support Broncos Nation!